Since 1974 TACHE has been committed to the improvement of educational and employment opportunities for Chicanos in higher education, and believes in diversity and inclusion regardless of background. As an association the interchangeable term "Chicano" is used to include all of a Latino or Hispanic background, as well as those who support us, however we understand that there can be many interpretations of the term. The following excerpts shows an interpretation from three of our past Presidents. The term Chicano is one that signifies the history and legacy of a period of racism, discrimination, and segregation in the U.S. that required a civil rights movement by Mexican Americans and others. That movement included litigation, political activism, scholarship, and other forms of resistance. TACHE is an organization that is part of that movement which remains significant today. 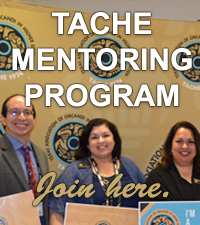 TACHE was formed to improve the higher educational opportunities for Mexican Americans/Chicanos and support those professionals within higher education. TACHE continues to be critical since access to higher education and degree attainment for Mexican Americans/Chicanos/Hispanics/Latinos still lags that of Whites. Additionally, we need more of that group represented in the leadership of our higher education institutions. We must also be consumers of the scholarship increasingly being written by Latinos about our history and struggles, including in the form of poetry, music, and art. Inclusivity of Latinos (e.g. Mexican Americans, Puerto Ricans, Cubans, etc.) is very important as we need to raise the higher education attainment of all these groups. Mexican Americans comprise about two-thirds of the U.S. Latinos and will continue to be a significant portion of the Latinos we serve. At this point in our history, systemic racism still exists and micro-aggressions occur. TACHE provides us with the opportunity to teach others and ourselves about advocacy, social justice, and inclusion. Additionally, TACHE provides professional development through its annual conferences and makes accessible Latino scholars and leaders who validate us and affirm that our history (including the Chicano movement), culture, and traditions are an integral part of the American experience. TACHE has also made it a high priority to provide fellowships to honor outstanding graduate students and higher education faculty and staff for their contributions in support of TACHE’s mission. TACHE has encouraged the formation of chapters on university and college campuses which has spread its influence throughout Texas and the awarding of scholarships to undergraduate and graduate students. The term Chicano as part of TACHE will forever remind us of how we started, where we’ve been, and the journey we still need to travel together into the future. Chicano - a person who identifies with Indigenous Americans who have been treated as little (Chico) or lesser than, due to discrimination, racism, and exclusion; and supports efforts to create equity in education, cultural and historic relevance and prosperity. The original thirteen steering committee members proposed the use of the term “Chicano” based on its historical and political meaning. Additionally, in our thinking, Chicano best represented the purpose of what TACHE was designed to stand for: fair treatment and proper representation of students, staff, faculty and administrators of Mexican descent in Texas institutions of higher education, K-12 schools and society. The 1974 conference attendees voted for the name, TACHE. Politically, being called a Chicano meant you were low class and uneducated. Chicanos did not fit into the American melting pot scheme because they did not assimilate into a WASP society. The gringo establishment wanted “Mexican-Americans” to accept the consequences of the acculturation process, i.e., not speak Spanish, not identify with Mexican culture, and accept the Anglo Saxon version of History. However, with the start of the 1960s, the self styled “Chicano Movement” began with events like the LA City Schools student walkouts led by Sal Castro, the Crystal City Texas school protests led by Jose Angel Gutierrez, the Cesar Chavez farm labor efforts, and the political organization of La Raza Unidad Party. These groups and leaders adopted the terms “Chicano” or “Raza” instead of Mexican-American, Latino or Hispanic. These groups took “Chicano” and gave it a new and positive meaning. Its use reflected our beliefs. We are not “disadvantaged”, instead we are bilingual, talented and skilled. We are able to navigate two cultures and lead within our own community. We are capable of proposing solutions to problems. We will not remain silent but instead be active. We will embrace our dark skin and Indian blood line over “Spanish-European” ancestry. We stand against discrimination of all people, advocate for inclusion, justice for all, and equal opportunity. Chicanos, now more than ever, means people who stand up and challenge those who want to eliminate the hard fought and legitimate gains of groups like TACHE. Our leaders and members must continue to support groups and institutions who want to protect the progress made by Chicanos everywhere. We have opened up a discussion for our membership to hear what Chicano means to you. Share your definition of Chicano in our Member Discussion Forum.